Sing and Dance with Me! Music and movement in Spanish for children 0-5 and their adult caregivers. Canta y Baila Conmigo™ is a unique curriculum with dual, complimentary goals of music education and language immersion. Designed for beginners and native speakers alike, Canta y Baila Conmigo™ creates a playful, interactive atmosphere where language learning is integrated naturally and organically in the musical experience. While children are effortlessly absorbing and using the Spanish language, they engage—along with their grown-ups—in age-appropriate explorations of melody, rhythm, movement and instrument play that help nurture a strong foundation in music literacy. Each semester of Canta y Baila Conmigo™ features a different collection of carefully selected folk classics, familiar children’s songs and new adaptations of traditional songs and rhymes, all beautifully arranged and recorded for the family take-home CD. In addition to the CD, families receive a songbook containing Spanish lyrics, sheet music, cultural information, and an English Language supplement for Spanish learners with song translations and language notes. 45-minute classes full of song, dance, and instrument play...where learning is fun! Age-appropriate instruction by native Spanish speakers, talented musicians, and experienced educators. Engaging music recordings carefully selected to represent the wide variety of Hispanic musical traditions. A take-home CD and songbook with lyrics, sheet music, cultural notes, and an English Language Supplement for families learning Spanish. Four collections in all so you receive new music each semester. A community that welcomes all levels of Spanish speakers. 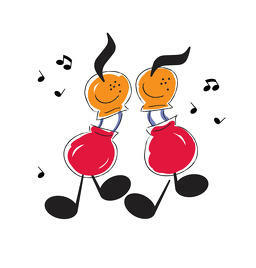 A great place to shake, shimmy, and cha-cha-cha to your hearts content. Esta clase se ofrece completamente en español para crear una experiencia de inmersión total. Sin embargo, la clase no está limitada a personas con completa fluidez en español. Estudiantes principiantes e intermedios del idioma que quieran aprender junto con sus niños podrán disfrutar de un ambiente divertido, seguro y acogedor donde envolverse en el idioma y las tradiciones musicales del mundo hispano. Los participantes recibirán un cancionero y CD creado especialmente para cada sesión. Music Together® nuestra maestra Maddie Welch tiene amplia experiencia en música y teatro y ha sido maestra de educación bilingüe en Massachusetts por más de 10 años. Copyright © 2019 In Harmony. All rights reserved. "Palo Palo” ©1999. All songs copyrighted Music Together LLC. All rights reserved. Sound clip used by permission of the copyright holder.